At check-in, I was offered a business class upgrade to my outbound flight for a little over $100, and for a four hour flight, that wasn't bad at all - so I took it! Weather in New York delayed the inbound flight arrival, so I bided my time at the airport lounge at Newark - not my favorite airport, but it's pretty much the only option for an international flight on United. 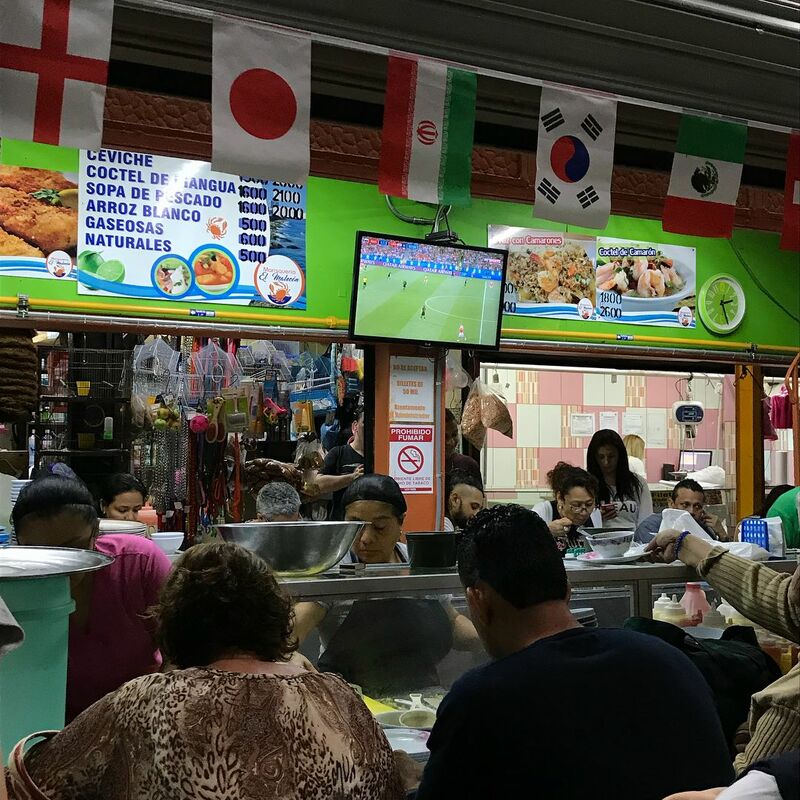 The Brazil vs. Belgium World Cup game was being shown on TVs all around the lounge, and many flyers were glued to the screen watching the action. My flight ended up leaving about an hour and a half late, so I would be getting into San José pretty late. 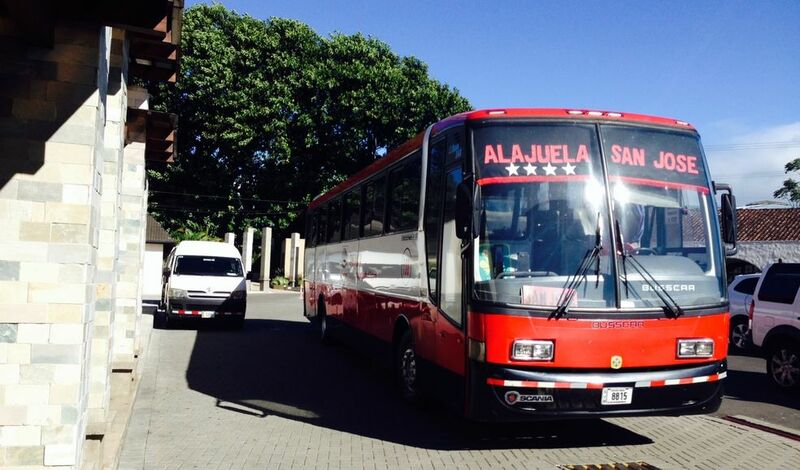 We arrived in San José around 9:30pm, arriving in a time zone two hours behind New York City. I was first off of the plane, so immigration was pretty quick, considering we were the only flight getting in at that time. I exchanged some dollars into colones (not a great exchange, so I would highly consider going to a bank in the city to avoid the upcharge) but planned on jumpstarting my trip on an adventure, finding my way to the bus stop just off of the airport exit, and behind the multilevel carpark. 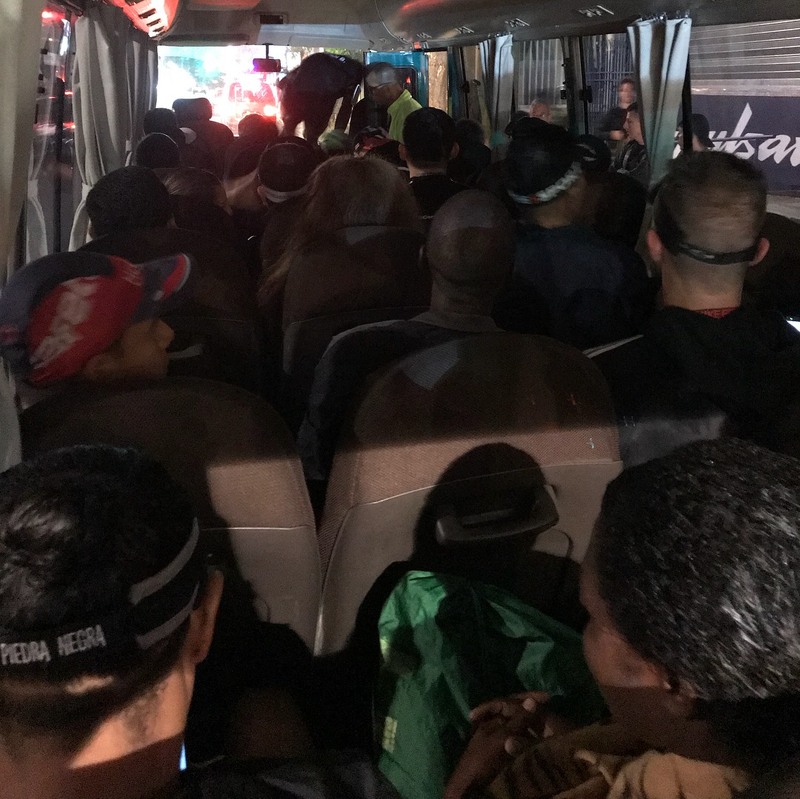 Finding the bus was pretty easy, despite multiple buses coming through; the bus from Alajuela to San José was clearly marked on the front, and only cost me 550 colones, or roughly $1. I closely monitored the buses route on the Moovit app (highly recommended for trips on public transportation internationally) and disembarked at the bus stop on San José's Paseo Colon closest to my Airbnb some 25 minutes later. 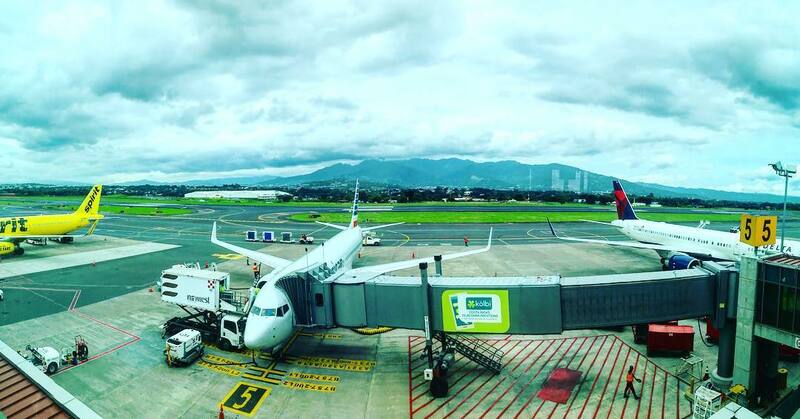 Most people don't spend much time in San José, as many visitors just use it as a gateway from international destinations to get to other locations within the country with bigger tourist draws, like the beaches, the volcanoes, or the cloud forests. 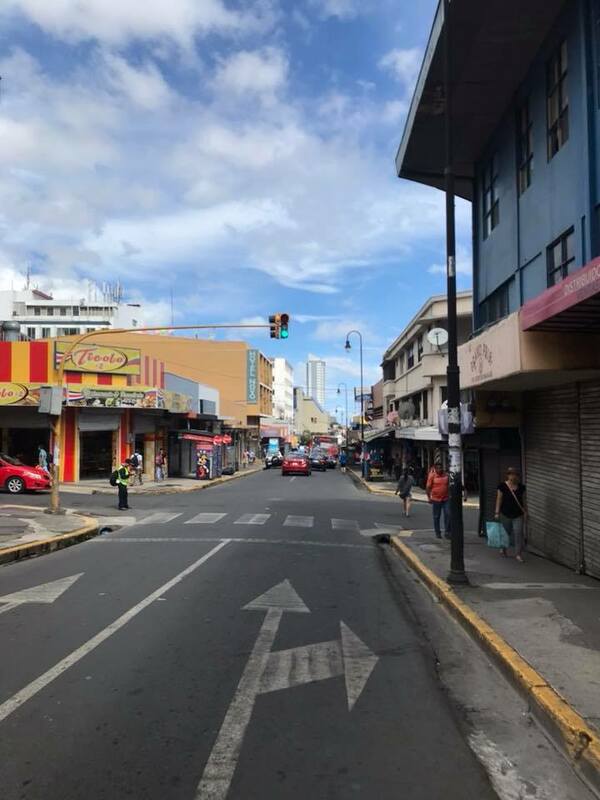 It doesn't make a great first impression, with its unremarkable concrete structures and honking traffic, and it's not a secret that it's not the safest city either (but it is one of the safest in Latin America.) I had my reservations walking around after dark, but luckily my Airbnb was in a condo building only three blocks off of the main strip, and just behind the Park Inn by Radisson. I had kept in touch with my hosts Gustavo and Randall via Airbnb and WhatsApp on my phone to let them know of my flight delays, and they arranged for the building receptionist to let me through up to the apartment, where entry was quick and easy with a digital code. They weren't home when I arrived, but I did meet them before I went to bed for the night. The next morning after a restful night's sleep, I was craving casado, a staple of Costa Rican cuisine. Standard components of the meal include rice, beans, and a large helping of protein. A quick google of places near my Airbnb that served this dish found a very popular place only a few blocks away called Soda Tapia. 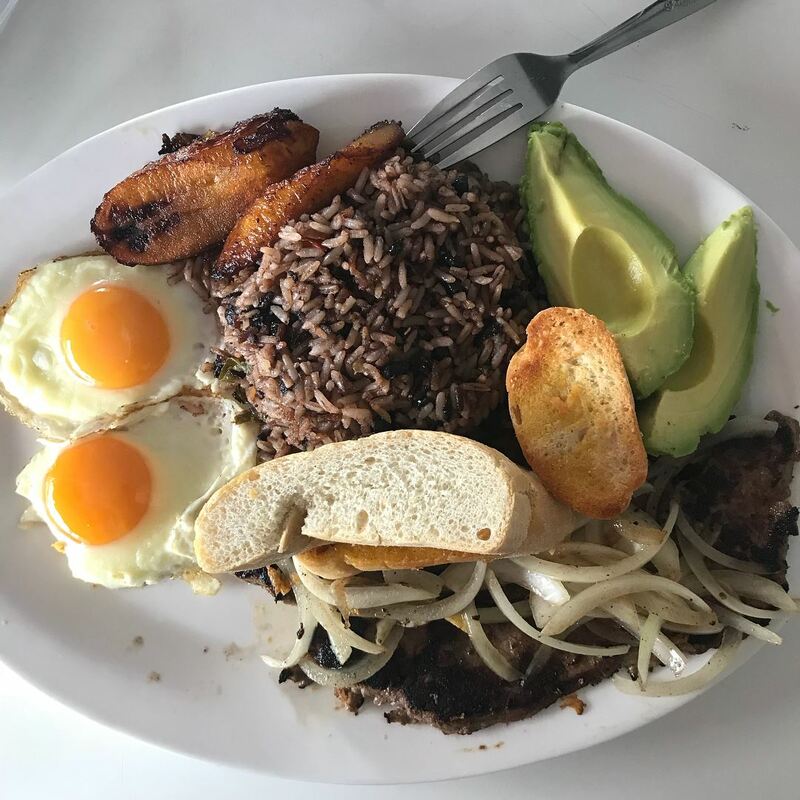 It was pretty busy when I arrived around 9:30, and along with a cup of cafe con leche, I ordered a casado with lomo (sirloin), eggs sunny side up, sweet plantains, and a couple slices of toast. A duo playing the marimba stopped by to play some music for us, including a little "Despacito" - it's definitely not played out in Latin America! 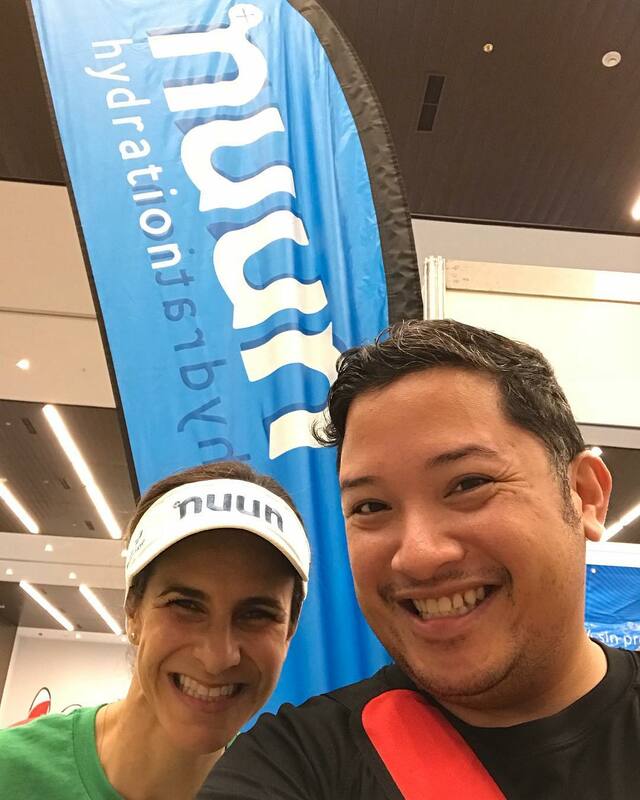 With Mariana, from Nuun CR! 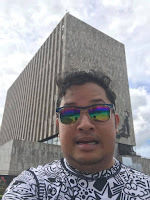 After cleaning my plate, I walked down the block to a bus stop along the busy road to take me up to the brand new Costa Rica Convention Center, opened only in April 2018, and Costa Rica's first convention center. The country’s first purpose-built convention centre aims at positioning Costa Rica as a serious player in the international events market. It's actually on the way to the international airport, so very easy to get to. The expo was pretty sizeable for an up and coming race, and upon arriving, I got to meet up with distributors from Nuun Hydration Costa Rica who I got in touch with prior to my arrival. 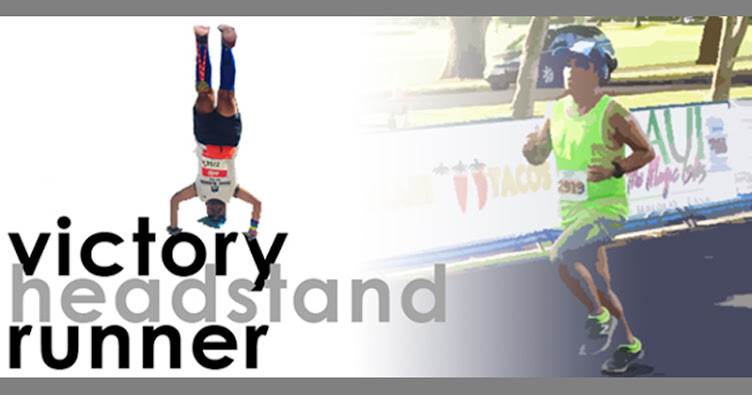 This was their first big distance race where they were hydration sponsors, after doing mostly 5Ks and 10Ks around the country. 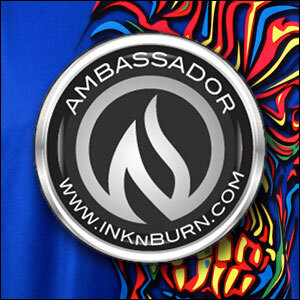 Included among the swag was a nice sized duffel bag, and two t-shirts - one of them being a finisher shirt. 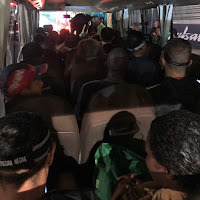 I also ensured I had a spot on the marathon shuttle that would leave VERY early on Sunday morning from Paseo Colon to take me to the start in Cartago. 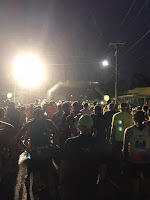 There were also two other race distances, a half marathon and 10K, that had later start times and race starts in different locations that we would pass along our marathon race course. All distances would finish in the 153-acre Parque La Sabana, Costa Rica's largest and most significant urban park. I left by 11:30, and headed into the heart of the city (by bus again), to enjoy Costa Rica as a tourist. It started to rain as we drove back into town. The bus dropped us off near the Iglesia Nuestra Señora de la Merced, and thankfully I brought an umbrella as I walked in the rain eastward toward Parque Central and the Metropolitan Cathedral of San José. My ultimate destination was the Teatro Nacional, a crown jewel of architecture and considered the finest historic building in the capital, known for its exquisitely preserved interior. I joined a small tour group with an English-speaking tourguide that took us into the auditorium, the boxes, and the theatre's grand foyer, as we were given a history of how the theatre was first constructed, and the background behind some of the beautiful artwork that adorns its walls and ceilings. 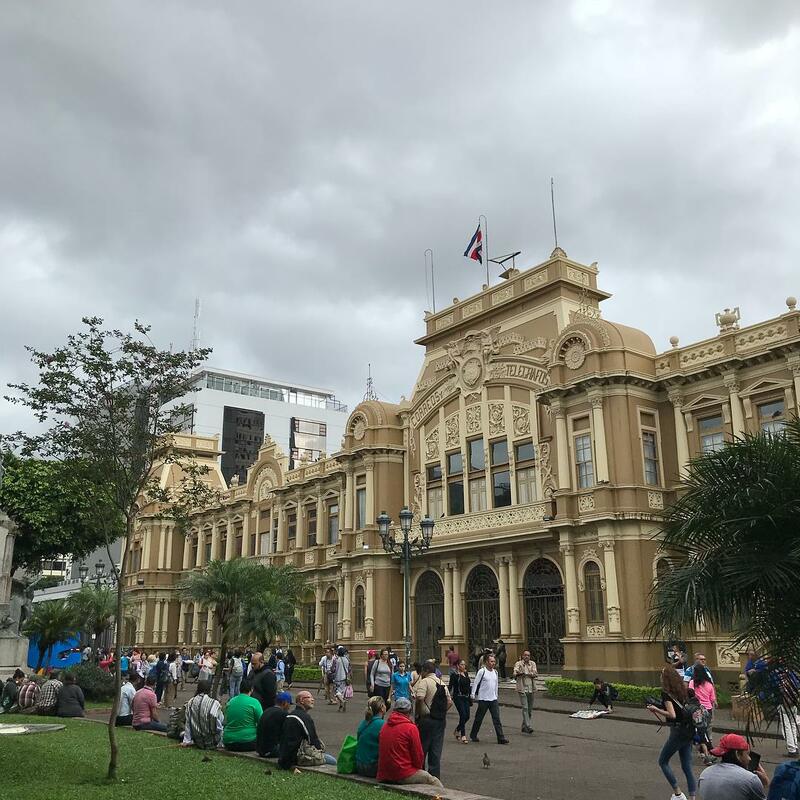 It was still raining after the 35 minute tour concluded, but I headed outside next to the theatre onto the Plaza de la Cultura, one of the city's main squares situated along one end of the pedestrian only Avenida Central. Behind the plaza was the Museos del Banco Central de Costa Rica, a museum built underground, where a permanent collection of pre-Columbian gold artifacts as well as an exhibit on the coins and bank notes of the country over its history, was located. 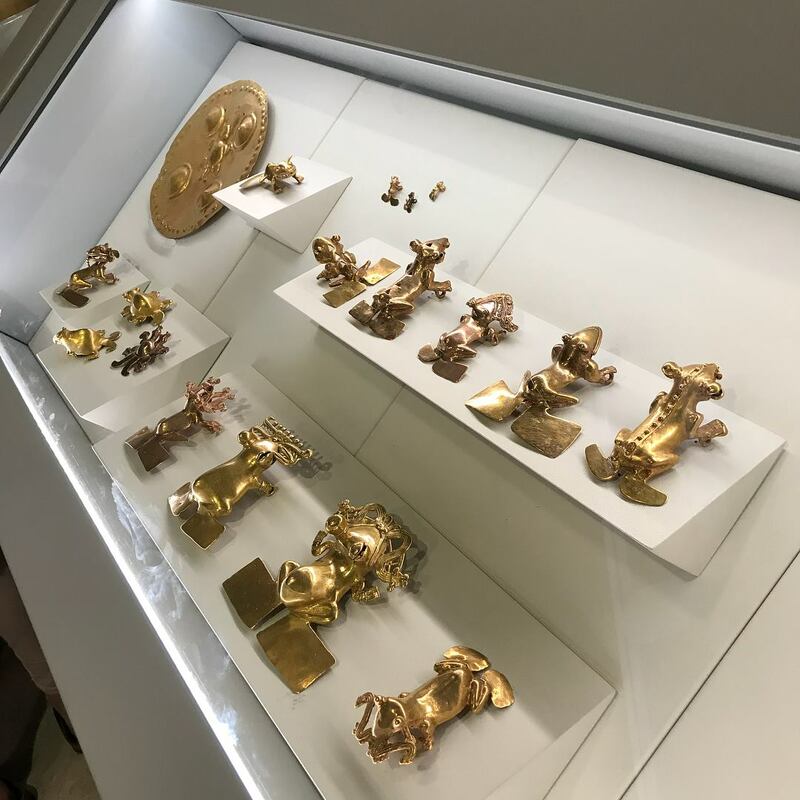 Unfortunately, the pre-Columbian gold museum was closed for renovations, but the Numismatic Museum (featuring the history of Costa Rica’s coins and banknotes) and an alternative exhibit was on display showing a smaller amount of gold artifacts. Nevertheless, I enjoyed learning a bit about the country's history through its currency. Seriously, this is the post office. The rain had finally stopped, and I walked around to see some other sites in this part of the downtown area, which included Parque Morazan (once a notorious center of prostitution, but now a peaceful public space; its Temple of Music, a concrete bandstand in the center of the park, serves as an unofficial symbol of San José), Edificio Metálico (a school building made of 1000 tons of pre-fabricated metal pieces, pre-built in Belgium and shipped piece-by-piece to Costa Rica), Casa Amarilla (an elegant colonial-style yellow mansion that houses the Ministry of Foreign Affairs, and where JFK planted a ceiba tree during his 1963 visit to the country), Villa Amon (once a presidential mansion and the British Embassy in the 1950s, now a six bedroom home available for short stays), and the Edificio Correos/Central Post Office and Telegraph Building (a very ornate, neo-Renaissance style building completed in 1917). We would be running by some of these sites during the marathon as we made our way through the downtown area the next day. Eventually, I made my way toward Mercado Central, the city's largest market. 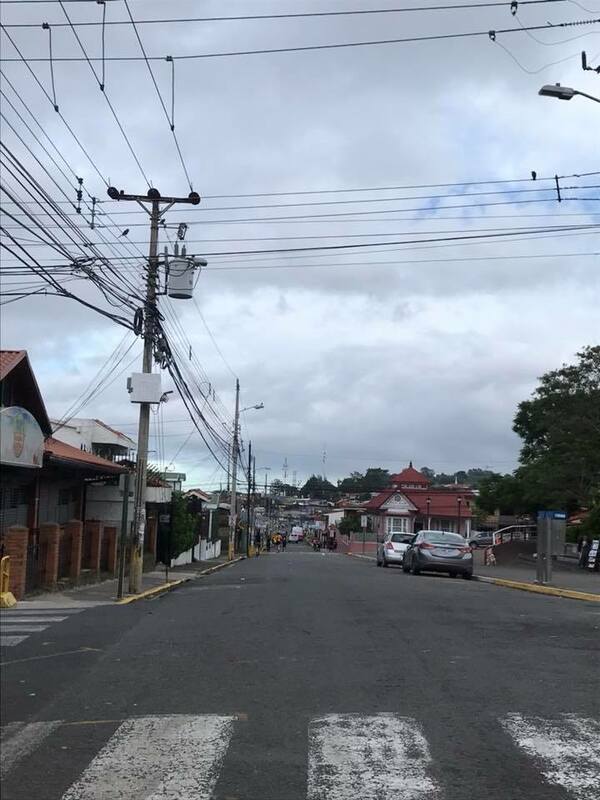 Established in 1880, it occupies an entire city block along San José’s Avenida Central, and is a big tourist destination where tourists can experience the real daily life of Costa Ricans. A labyrinth of narrow alleyways with a few hundred shops, stalls, and sodas, the market has everything, from meats, fish, fruits, vegetables, spices, coffees, clothing, flowers, cooked meals, local handicrafts... it was actually quite exciting to watch the Russia va Croatia World Cup match, which was played on tvs all over the market - even in pet stores. It was interesting to note that while Costa Rica had qualified for the World Cup this year (only their 5th time in history, yet, they've managed to qualify in four of the last five) but had already been eliminated in the group stage, everyone was glued to the action on TV - after all, the World Cup happens only every four years, and football is a BIG deal in all of Latin America. 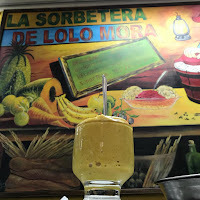 I stopped at a small soda to watch while I enjoyed a cold glass of horchata; later, after Croatia scored their winning goal in penalty shootouts, I stopped to enjoy a small cup of helado de sorbetera (homemade artisanal cinnamon ice-cream) from La Sorbetera de Lolo Mora, a San José institution since 1901. As the afternoon began to wane, I walked back to my Airbnb after making a detour to see a beautiful domed building, the Iglesia Santísima Trinidad, in an area (Barrio México) that I'd later find out was one of the more dangerous parts of the city (oops.) I opted to stop into a Italian place near my Airbnb for a relatively early pasta dinner that night just after sundown, as I had a SUPER early 2:45am wakeup call for race morning. Packed bus to the start. The following morning, I got myself dressed and quietly out the door to hopefully not wake up my Airbnb hosts, and jogged over to the shuttle area about 10 minutes away, located on the normally very busy Paseo Colon, only a block down from the entrance to Parque La Sabana. A gaggle of runners were already lined up along the sidewalk waiting for the bus. The humidity was palpable - the forecast actually showed that it was going to rain in those early hours of the day. 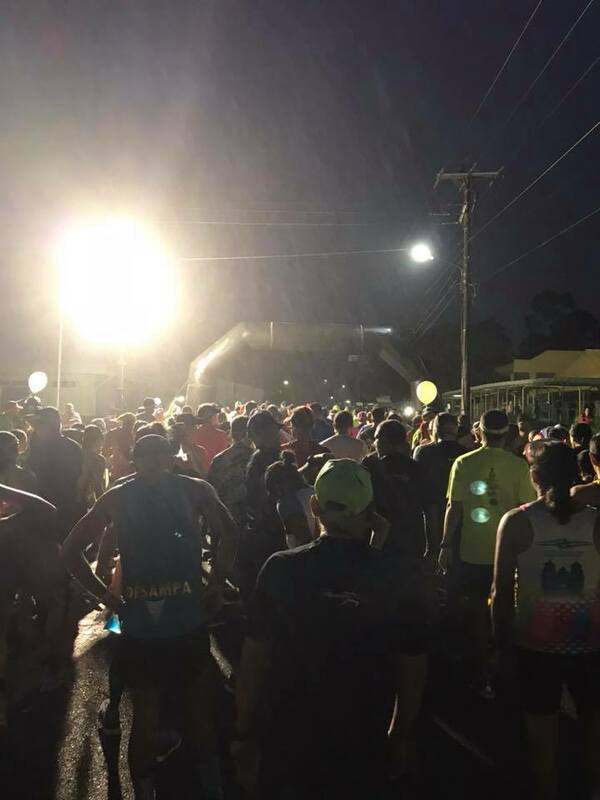 Leaving promptly at 3:30am, our bus, filled to capacity with runners, quietly made its way through the city of San José out to the start, some 15 miles east in Cartago, Costa Rica's first capital city from 1574 to 1824. 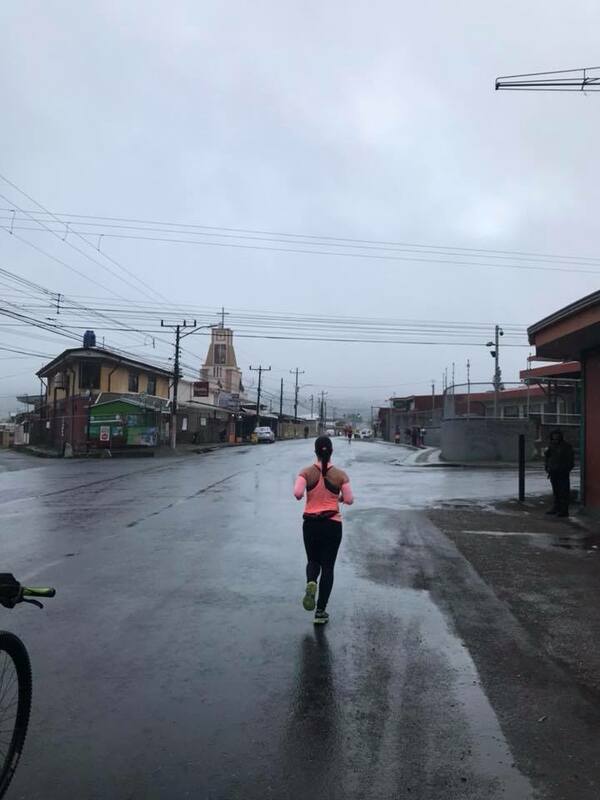 Lying at the base of Irazú Volcano, Cartago's elevation was at a breath-shortening 4,600 feet, so I knew I was going to need to not push too hard to maintain a decent pace for the duration of the race. Plus, with it being so early, I dozed off, waking up an hour later when we arrived in Cartago. We arrived at the campus of the Instituto Tecnológico de Costa Rica in Distrito Oriental, one of the most prestigious higher education institutions in the country and one of Central America's most important engineering schools. We shuffled off to the campus gymnasium in front of the track, to stretch out, fuel up, and wait for further announcements before heading out to the startline. Race organizers provided some snacks and coffee, which I normally don't take prior to a marathon, but I drank some in order to perk up a little bit for the early start. At about 4:50, we headed out the door and to the startline. Already misting at that point, we assembled on the street in front of the School of Language Sciences, and were off under cover of darkness, with only the streetlamps lighting our way by 5am. It was humid, slightly windy, and 68°, with the day about to get warmer, once this rain passed. We made our way out of the campus and onto Avenida 14 then slightly doglegged over to Avenida 12, an uphill mile that got us nearly 100 feet higher than at the start. Nevertheless, I managed a passable 10:16 mile. 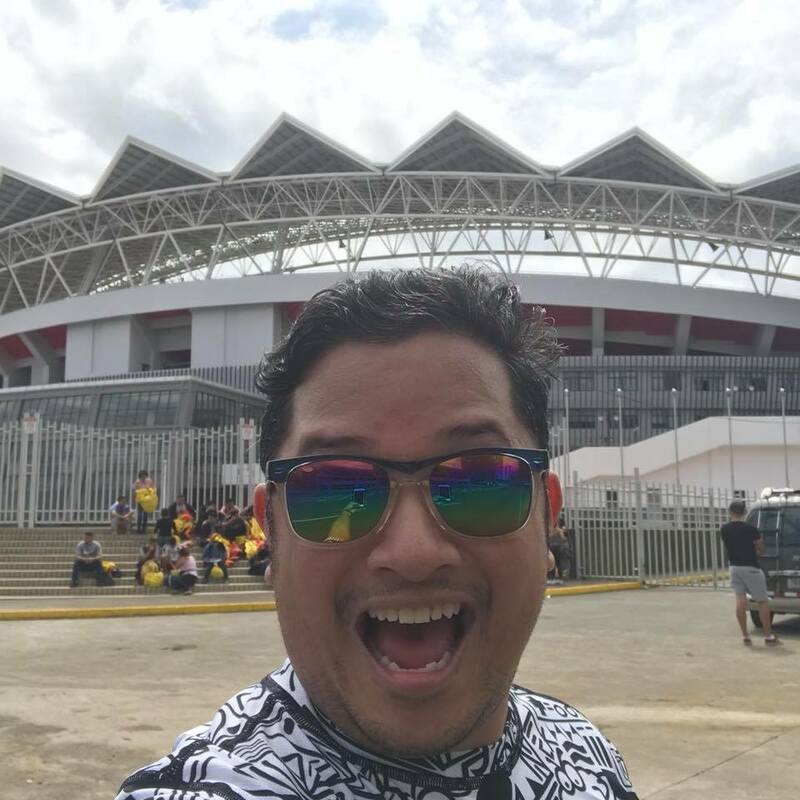 We then passed by the Estadio José Rafael Fello Meza Ivankovich, home to the Club Sport Cartaginés, the city's football club, and the oldest in Costa Rica. The mist gave way to drizzle, then full out rain, which would continue over the next 90 minutes. We turned left onto Calle 6, then took a sharp right onto Bulevar el Molino, staying fairly flat until we veered right onto Avenida 4, after passing by the very crowded General Cemetery of Cartago. 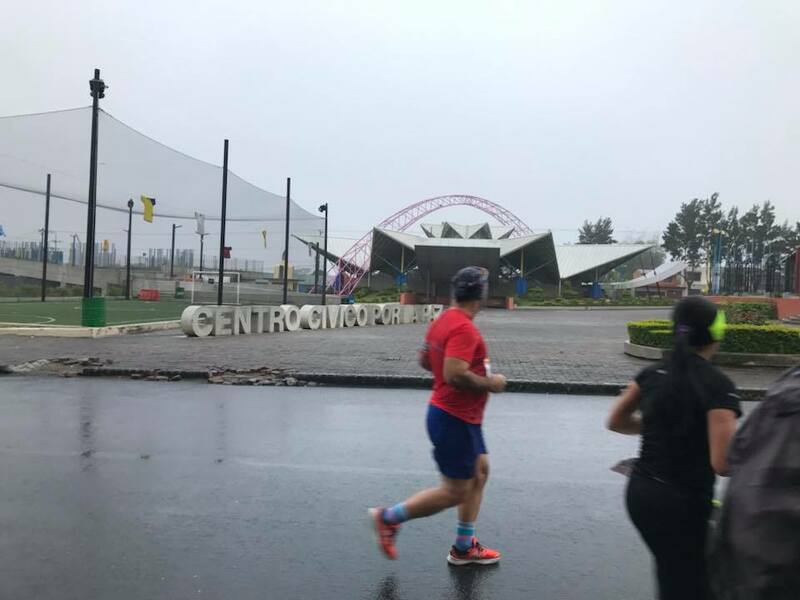 It was raining harder by then, so I barely took notice of my surroundings, only hoping that my wet shoes and socks wouldn't affect me for later in the race. 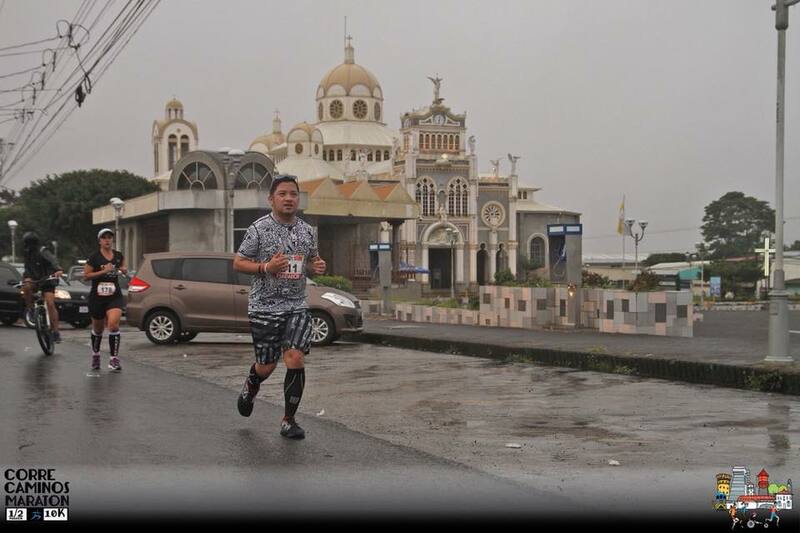 We ran roughly 1.5 miles eastward, with the iconic Basílica de Nuestra Señora de Los Ángeles coming into view beyond the curtains of rain coming down, then began our as rather zigzag-y route through Cartago’s streets, running one block up, then heading westward on the Avenida 2 for a mile; running one block up past the Centro Cívico por la Paz and the Anfiteatro Municipal de Cartago with its sharply angled, star-like roof, then heading eastward on Avenida Central for a mile. We would pass by the Cartago's central park, the Plaza Mayor, and the ruins of Santiago Apostól Church, a Costa Rican Cultural Heritage site that has had several churches that were built then destroyed by earthquakes over the centuries, but never truly finished. Local folklore refers to a story about two brothers during colonial times who fell in love with the same woman, though of course the woman chose one of the brothers; the other brother was infuriated and beheaded the brother that was chosen, and in penance for his mortal sin, he built a church for the city that would end up being destroyed a year after its completion. Each time it was rebuilt, another earthquake would destroy it, making it out to be a cursed site. It is said that on foggy nights inside the ruins, a headless man is seen wandering for eternity as his penance for desecrating a holy site. Despite the weather conditions and the day having started, I am happy to say I didn't see any eerie sights as we passed by the ruins. 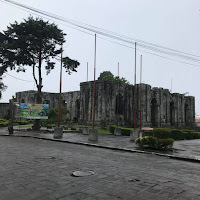 Our last part of the zig zag had us round the Basílica de Nuestra Señora de Los Ángeles, Cartago's most important site and Costa Rica's most venerated religious shrine. First built in 1639, the church is built in a unique mix of colonial architecture and classic Byzantine style, and houses a small statue of the Black Madonna, known as La Negrita, who supposedly has great healing powers. Each August, close to 2 million pilgrims make a 22-kilometer spiritual journey (known as the Romería) to the basilica, many of them on their hands and knees as a demonstration of their piety, originating from various points throughout Costa Rica. After earthquakes over the centuries (including one shortly after it was built) had partially destroyed the building and kept it crumbling and incomplete, it was restored in 1912 by architect Lluis Llach Llagostera in a project that was finally completed in 1924. 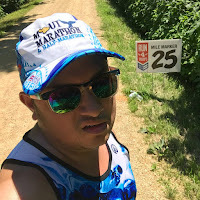 Now six miles into the race, and only 62 minutes in, I had maintained a fairly even pace, keeping my mile splits anywhere from 10:01 to 10:29. We ran our westward mile out of Cartago along Avenida 1 del Comercio, turning slightly right onto Transversal 20 and the Via 236 that went over the Rio Reventado. We then ran through the district of Taras, Cartago's second largest district in terms of population, as we began our the uphill ascent along the Inter-American Highway, the Central American section of the 19,000 mile long Pan-American Highway that streteches across the American continents, just before the 8 mile mark. 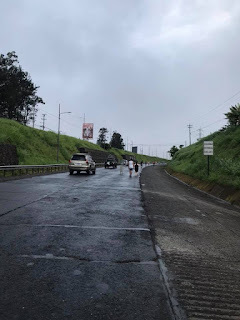 We would run along the shoulder of the highway separated by a metal barricade, with the ridged - starting to get quite busy, as the city was beginning to wake up (and this road was the only road between Cartago and San José) - walking quite a bit as the course took us to the highest elevation point of the whole race, around mile 9.5. The uphill definitely registered in my mile splits - mile 8 was an 11:14, while mile 9 was a 13:36. The look of determination down the downhill section of the course. 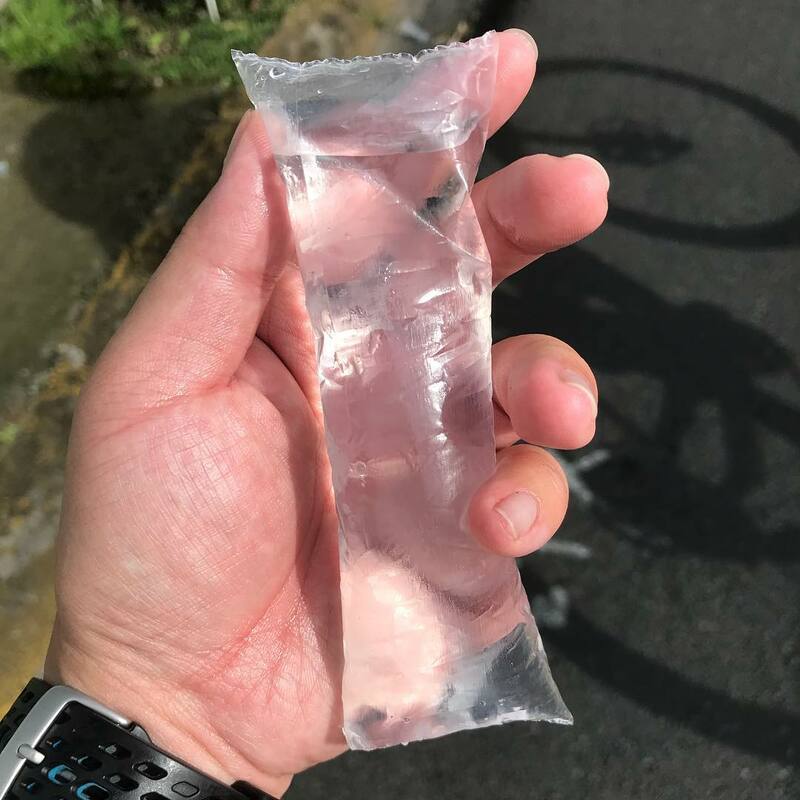 Bite the baggie, drink the water. 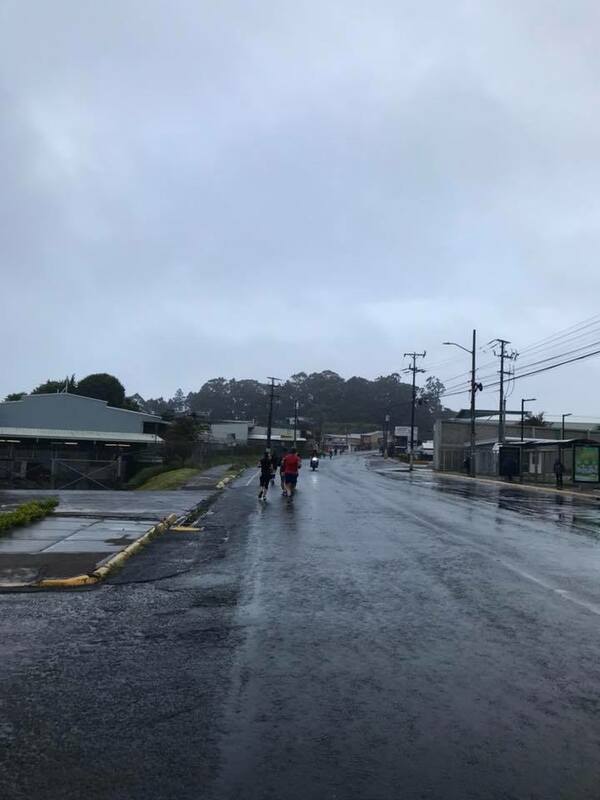 We finally started running downhill after the 10 mile mark, and I posted my two fastest miles of the race at 11 and 12 as we "exited" the highway into Tres Rios, which happened to be the start of the half marathon earlier that morning. While the rest of the race from this point on was mostly downhill, my feet started to feel like lead, so I was taking LOTS of walk breaks. A note about our aid stations thus far: they were well stocked with individual plastic baggies of water and Nuun Hydration strawberry lemonade... I became a pro at ripping the corner open with my teeth, though I did get a face full of water a couple times. Then again, I was already wet from running for so long in the rain. I hit the halfway point of the race in about 2:18, along Avenida 2 in the center of Tres Rios. 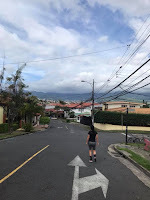 We were roughly halfway between San José and Cartago at this point, in the city most famous for its coffee, known internationally as one of the best in the world for its high quality. 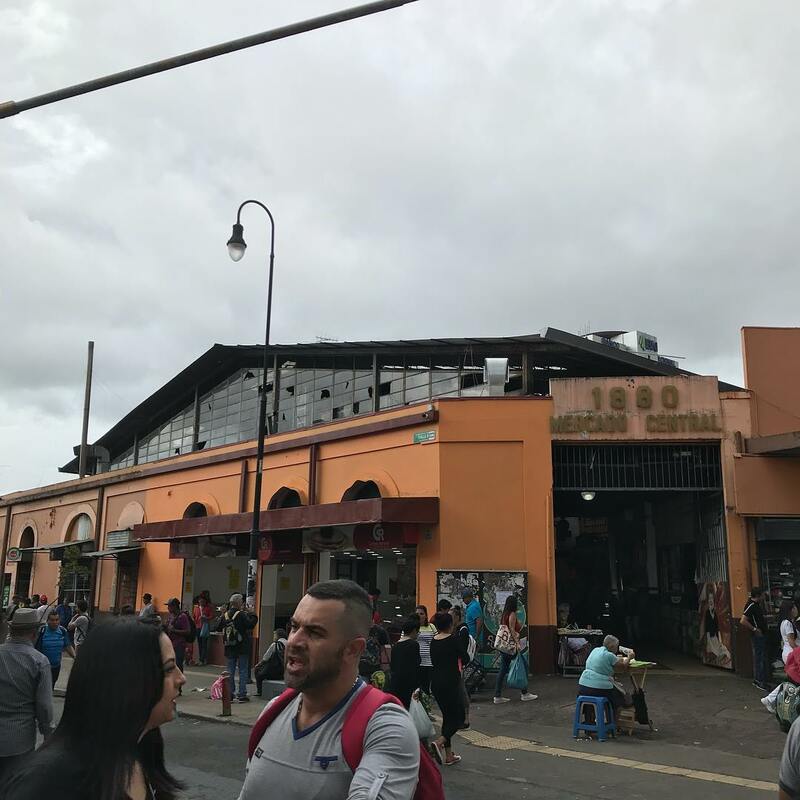 The soils in the region have been enriched by minerals from eruptions of nearby Irazú Volcano, however because of its proximity to the densely population metropolitan suburbs of San José, the area in recent times has become much more urban than agricultural. Our descent into San José proper continued along the Old Cartago Highway. 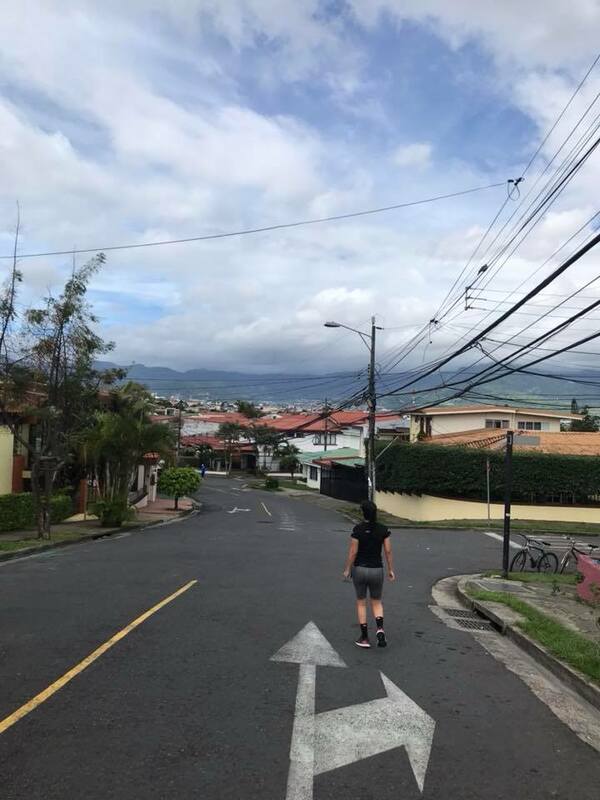 We enjoyed taking in some beautiful views and eventually made our way across the provincial border between Cartago and San José, finding ourselves passing through the northeastern suburbs of the city, first through the canton of Curridabat. 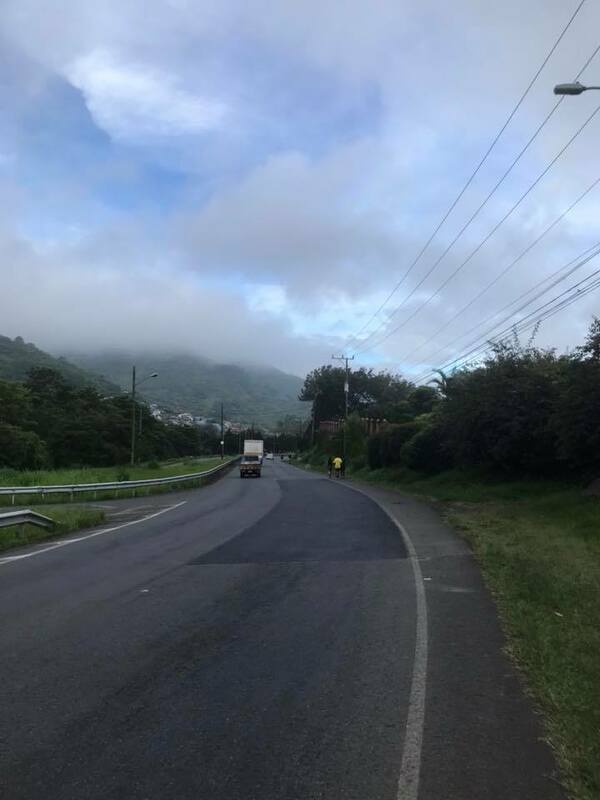 By mile 16, we were back along the route of the Inter-American Highway, on a largely busy corridor (now at 8 in the morning) with the city most definitely awake, and wondering why there were people running on the street in this baking sun. After the 17th mile, we turned left on a nondescript, mostly residential street, continuing our downhill progression, before turning right onto Route 215, passing by a large mall and the first of many government buildings we would be passing as we progressed through the capital. We had crossed into the primarily residential working-class Zapote District of San José. 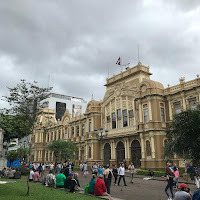 Now running along Via 204, we passed by the Casa Presidencial, or the Presidential Palace of Costa Rica, which houses the goverement offices of the president. It's newest inhabitant, the current president of the country Carlos Alvarado Quesada, had just been sworn into office two months earlier. We took another left turn, this time on Calle 35, eventually finding ourselves back on Route 215, now known as Avenida Estado de Israel. We ran along this busy street, eventually reaching Calle 13, and headed northward briefly, before taking Diagonal 10 along a slight uphill as we made our way to Calle 19. 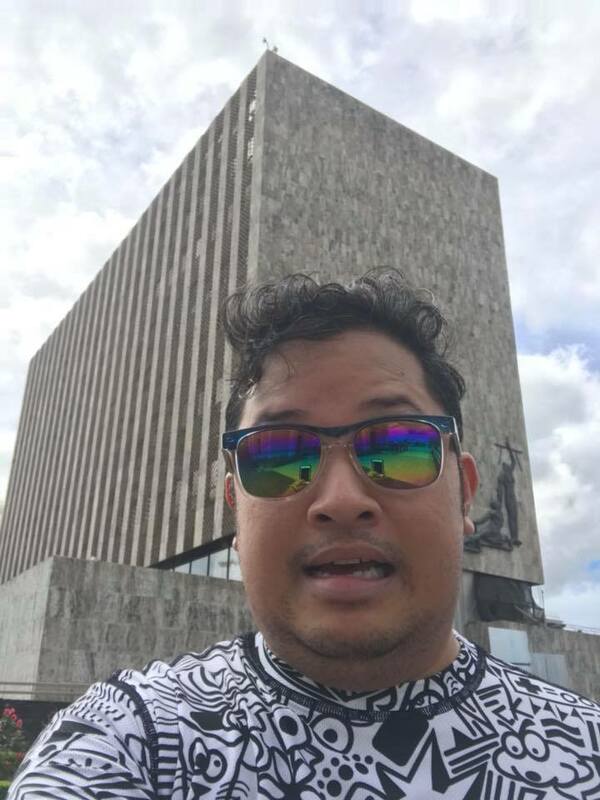 We ran past several important court buildings, including the Supreme Court of Justice building, a boxy brutalist style structure that is featured on the 50,000 colones banknote (equivalent to $83.58). We hit the 21 mile mark soon after, then turned left to begin our run through the streets of the city center. 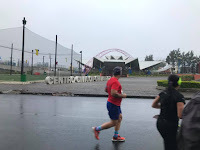 We ran around the edge of the Parque Nacional, one of San José's nicest green spaces, located in an area near the railroad terminal (just a couple blocks to the east). It's also the site of the National Monument, considered the most important monument in all of the country, representing defense of the independence and sovereignty of Costa Rica and the triumph of the Central American nations against foreign invaders, commemorate what's known as the Filibuster War or National Campaign of 1856-1857. 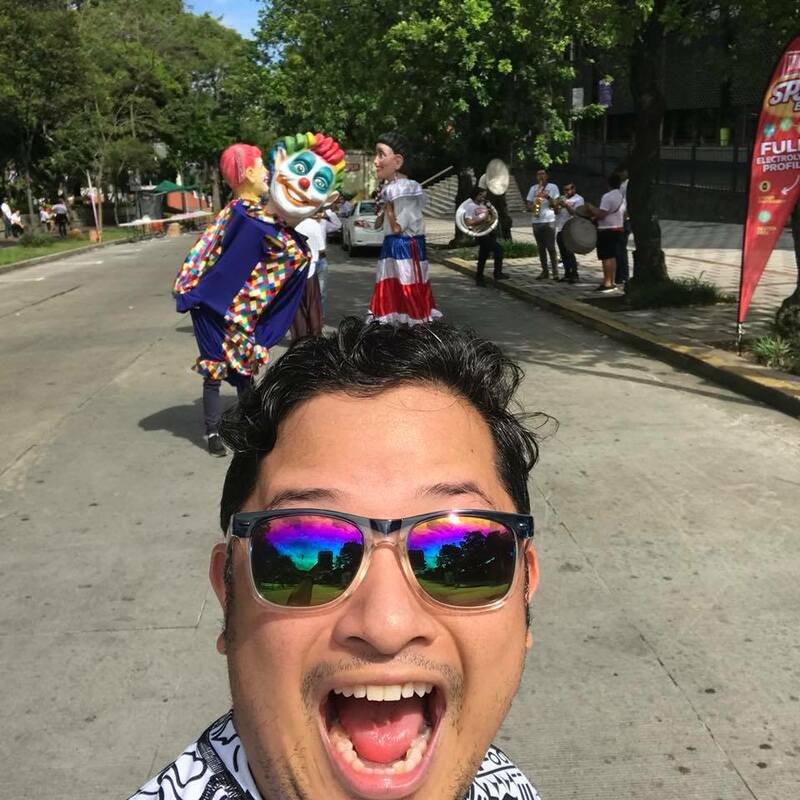 We were greeted by a brass band and some costumed revelers as we made our way along Avenida 3 and ran westward. Before turning onto Calle 9, we made our way past a few more important sites, including the Parque España (a small park where many birds roost, but also houses an ornate statue of Christopher Columbus, commemorating the 500 year anniversary of the explorer's landing in the country), the Edificio Metálico, and the Parque Morazan. 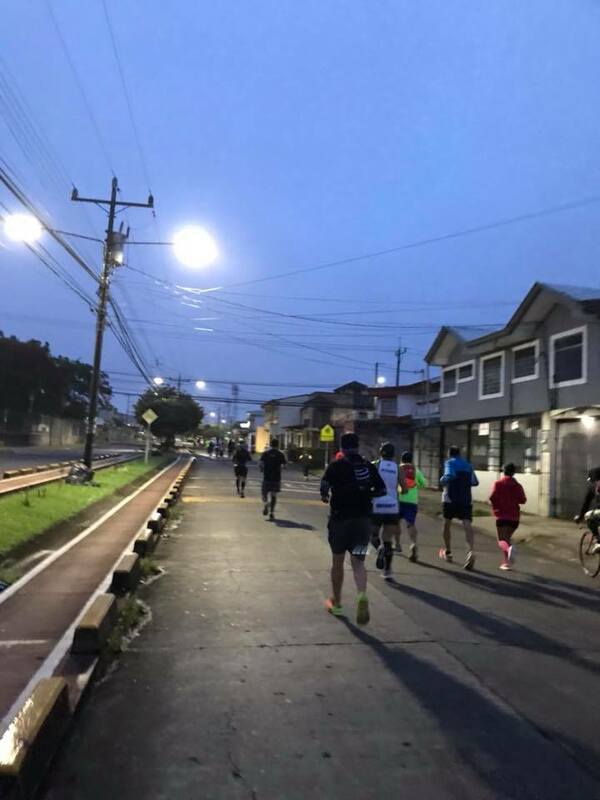 We then began to run along Avenida 1, right through the center of the city, and that's where the most irritating part of the race began. Now firmly past 9 in the morning, we ran through downtown San José, and I have to say, it was a bit of... well, a shitshow. The roads were not closed (which I didn't expect them to be) and we had to be mindful of traffic not only next to us, but also at intersections. Despite it being relatively flat from miles 21.5 through 23, it was probably the toughest part of the race for me mentally. 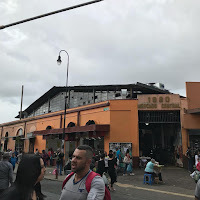 I just knew I had to get through this chaos, getting through the center of town, as we ran by sights I had seen the day before, such as the Edificio Correos, Mercado Central. 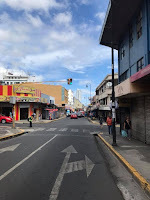 We turned left on Calle 20 near the National Children's Hospital, before continuing for a few blocks along the deserted Paseo Colón, where we finally got some solace from the traffic. It continued as we as we ran down Calle 28, and even passed the condo building my Airbnb was in. The route continued south, passing by the big privacy walls surrounding the crowded Cementerio de Obreros, then took a sharp left along Transversal 24. After curving our way aroud Calle 36, Avenida 16, and Calle 42, we turned left onto Avenida 12 to make our way around the perimeter of Parque La Sabana. Car free along the southern edge of Parque La Sabana, with the Comptroller General building in the distance. Thankfully, we had a car free road to run on as we ran along Avenida 12. The building of the Comptroller General in the distance provided a good landmark to run toward, with its pyramid like angled facade. 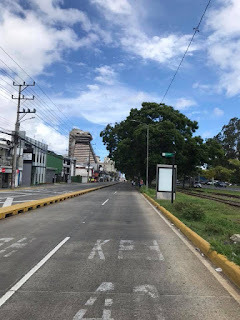 The road seemed to not end, but we finally turned right onto Calle 68, passing by the Estadio Nacional, or National Stadium, where football fans were beginning to gather for an afternoon game. Then we turned right onto Avenida de las Americas, and ran into the ugliest headwind for the final mile. Not only that, but car traffic returned. We turned right onto Calle 42 (actually a part of the Pan-American Highway, once again,) where traffic was bumper to bumper as we runners hugged the edge of the road. After the Leon Cortes Statue near the entrance of the park, we turned right into the park past the Museo de Arte Costarricense (Museum of Costa Rican Art.) 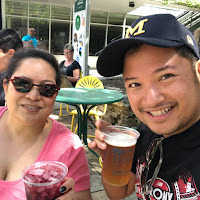 We dodged a few locals, just casually wandering down the public path, as we made our way to the "meta," or finish line along Calle de la Sabana. 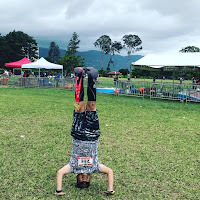 I crossed the mat in 5:05:21, a time I was very happy with, considering we had about 1,000 feet of elevation gain, 1,900 feet of elevation loss, and the whole race was at a high elevation, where the minimum was when we reached San José at 3,673 feet (Cartago was at around 4,600-4,700). Add to that the temperatures were high -- it was in the low to mid 70s when we finished. 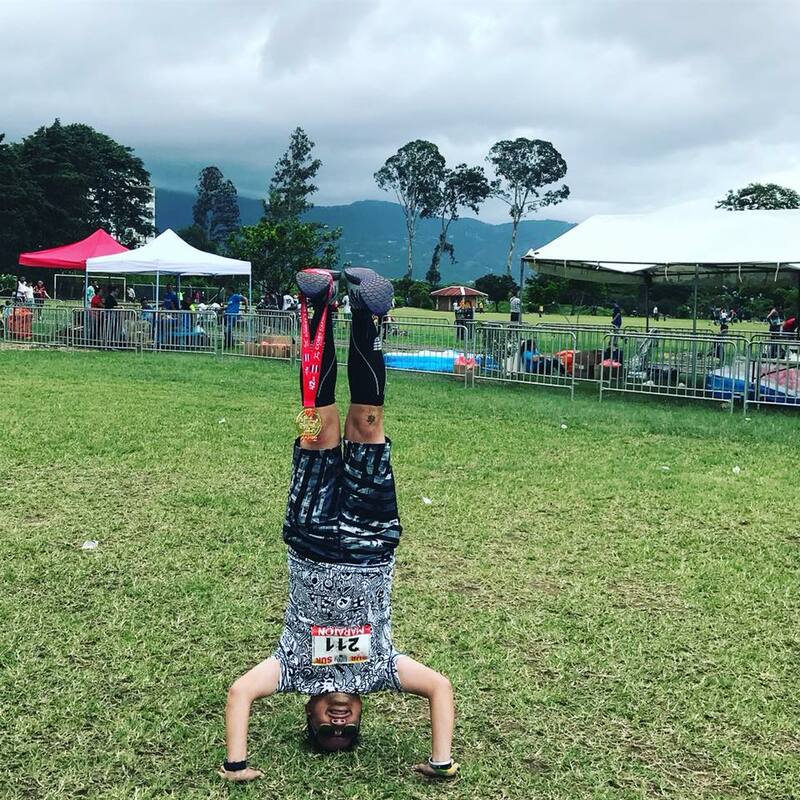 I gleefully accepted my medal, and headed into the park where I chowed down on a delicious dish of gallo pinto (traditional Costa Rican beans and rice) with scrambled eggs and tortilla. 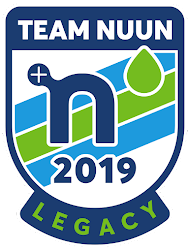 The Nuun Hydration folks were also out in the park, providing electrolytes to runners post race, and I got to chat with them a bit more, and get some more suggestions of places to go in the remaining day I had in town! I also got to meet Gustavo, the race's race director and president, and his partner Andres; it turns out that they also owned a travel company specializing in marathons for Costa Ricans to races around the world. I found a good spot to take my headstand photo in the park with the mountains in the background, before walking back to my Airbnb for a much needed and well-deserved shower. The course map of what I just ran! After the race, I had time to check out a couple ther sites in town before they closed, including the Museo Nacional de Costa Rica, housed in the former Bellavista Fortress. The saffron colored castle-like building, located opposite the Legislative Assembly Building of Costa Rica, was built in 1917 and was originally a military barracks; the exterior walls still have bullets lodged in them from the country's civil war in 1948. The museum houses artifacts related to Costa Rica's geological, colonial, archaeological, religious and modern history, but also an exotic butterfly garden, containing several gorgeous Blue morpho butterflies flying freely around a glassed-in atrium. I also went to the Museo del Jade, with its extensive collection of pre-Columbian artifacts, such as stone tables (metates), ceramics, ceremonial heads, adzes, and other decorative pieces from 500 BC to 800AD. 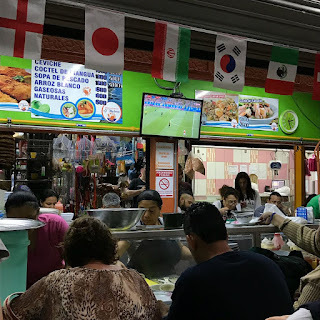 Later that night, I grabbed an Uber to take me just outside of the city center to the neighboring city of Escazú, where a Yelp search had suggested me to go to La Posada de las Brujas for an amazing meal... and all of it local Costa Rican Food! 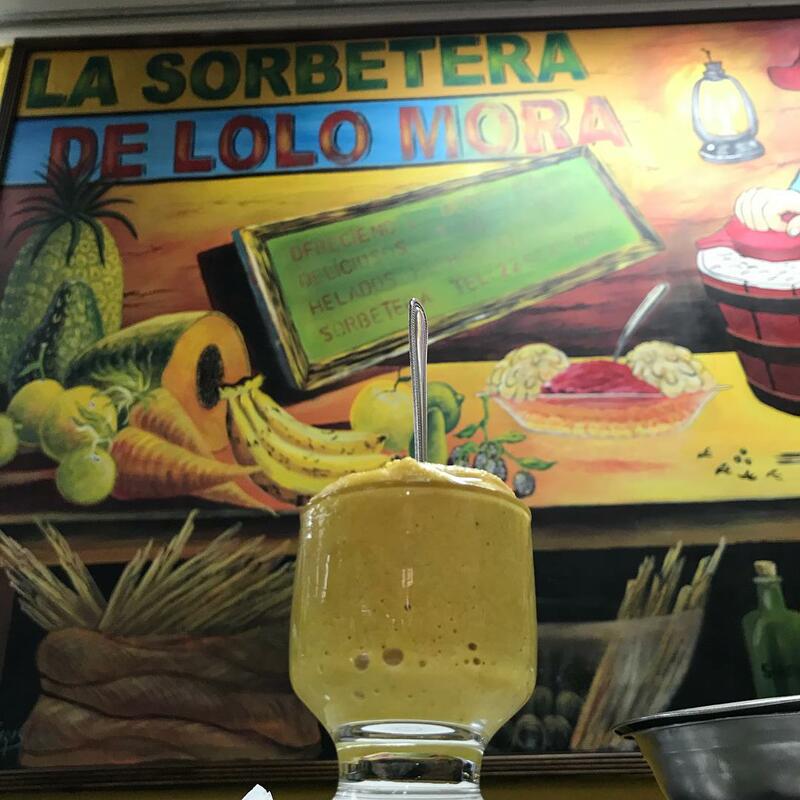 I came in starving, and ended up eating quite a bit, including patacones brujos (plantain with carne asada, topped with queso palmito), ceviche mixto, and an ollita de carne (meat stew) - all topped off with a massive maracuya (passion fruit) smoothie. Since it was evening, the area also offered some incredible views of San José some 5.5 miles to the east, as we were situated up the side of Cerros de Escazú at a higher elevation. The following day, I slept in a tiny bit before packing my stuff and heading out. I took an Uber to the airport this time, just in case the buses ran late (or I took the wrong one), and got myself through airport security quickly, getting to enjoy the airport lounge before my flight. I had booked a flight from San Jose to Fort Lauderdale on points with Southwest Airlines, then would transfer to a Delta flight back to New York, which I'd catch after clearing immigration. Everything went off without any hitches, and I even was upgraded into First for the last flight. After arriving back at JFK at 10:30pm, I was home before midnight, and ready to go back to work on Tuesday morning. Also, since my trip to Australia and Vietnam last year, I started to collect statuettes and miniature models to adorn my computer stand at work from every international marathon destination I’ve run. 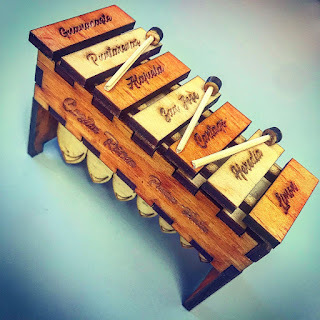 For Costa Rica, I got a little wooden marimba (marimbita? Lol) with the names of all seven provinces on the bars. 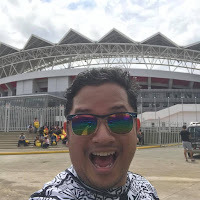 This trip I actually set foot in four of them - Alajuela (where the airport is), Heredia (where the convention center and race expo was), Cartago (where the race start was), and San José! It was a nice way to wrap up a great trip back to a country I said I would try to visit again. I'm sure something will bring me back there in the future! 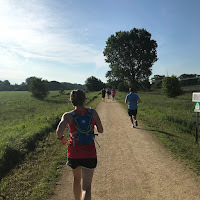 Finding a race in Iowa was particularly tough for me - while there were a range of options, the most ideal, the Des Moines Marathon, wasn't going to work with my existing schedule. By May, I finally decided to do Run4Troops, a race at the end of June, in eastern Iowa. 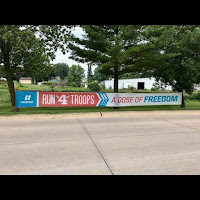 Run4Troops, a race whose proceeds supports our men and women in uniform is run entirely along the Heritage Trail, a 26-mile long multi-use rail trail connecting Dubuque and Dyersville, Iowa through the Little Maquoketa River valley. This portion of Iowa is part of a region that spans four states (Iowa, Illinois, Wisconsin and Minnesota) along the Mississippi River that were never glaciated. This area of Iowa is in stark contrast with the rest of the state, with large limestone bluffs and dramatic scenery. The gently sloping route of the Heritage Trail was converted from a segment of the former Chicago Great Western railroad line, built in the 1880s. Many of the bridges and trestles along the route were deemed unsafe for railroad traffic, so the railroad line was abandoned in 1981. 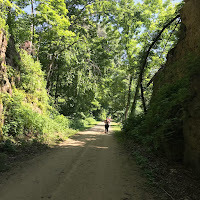 Now it is maintained by the Dubuque County Conservation Board, who acquired the railbed and created the compacted, crushed limestone trail in the mid-1980s, and many of the historic railroad bridges have since been replaced after flooding. All along the trail path, stone mile markers have been restored by the conservation board, with markers that indicate mileage to Chicago (C), mileage to St. Paul, Minnesota (S), and whistle crossing (WX). Home of "Field of Dreams"
I arrived late Friday night into Madison, Wisconsin, and picked up my rental car to drive to the home of my family friends Elin and Brady, who lived there and offered me free accommodation for the weekend. With Dubuque being roughly an hour and a half away from Madison, my plan was to wake up very early at 4:30am to do the drive over. I quietly left their house and got on the road, driving west to the Iowa state line, and arriving while the sun was rising for the day. We were directed to park in Dubuque near the Hilton Garden Inn, where school buses would take us to the start in Dyersville. 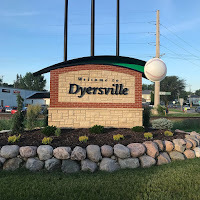 Tired from not having much sleep, we arrived in Dyersville to the parking area near the trailhead, marked by a picnic pavilion built to commemorate the start of the trail. 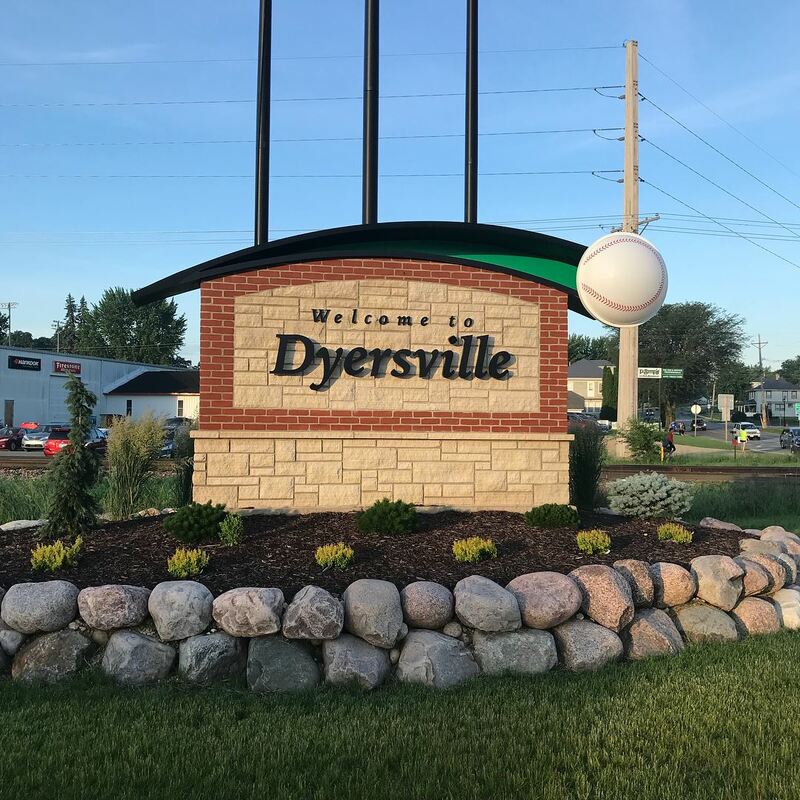 A quiet city of just over 4,000 people, Dyersville is actually a thriving farming city with a long history. It is nicknamed "The Farm Toy Capital of the World" because it hosts a farm toy show the first weekend in June and the National Farm Toy Show the first weekend in November. But it is best known as being where the movie "Field of Dreams" was filmed, at a farm about 3.5 miles northeast of the trailhead. 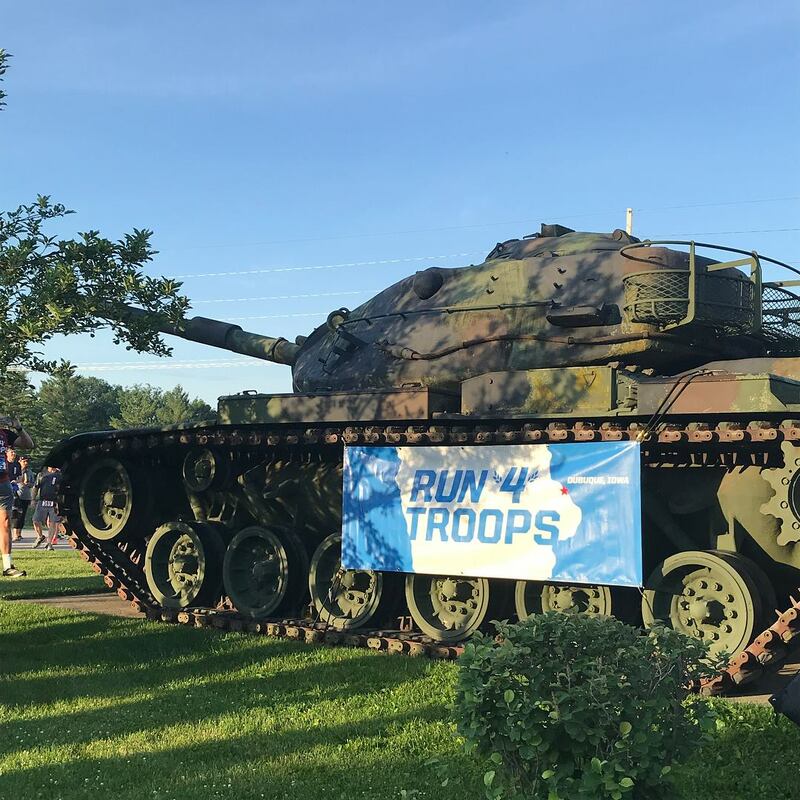 The race schedule in the morning would be as follows: relay teams would start at 7am, followed by the marathoners at 7:15, and then another set of relayers at 7:30. Strange, but I guess that works out for them in spreading out the field all along the narrow trail. After watching the first group head out, we were up, and like clockwork at 7:15, we were off. It was going to be a fairly warm day - the temperature was 63º, with incredibly high humidity, reaching 94%. 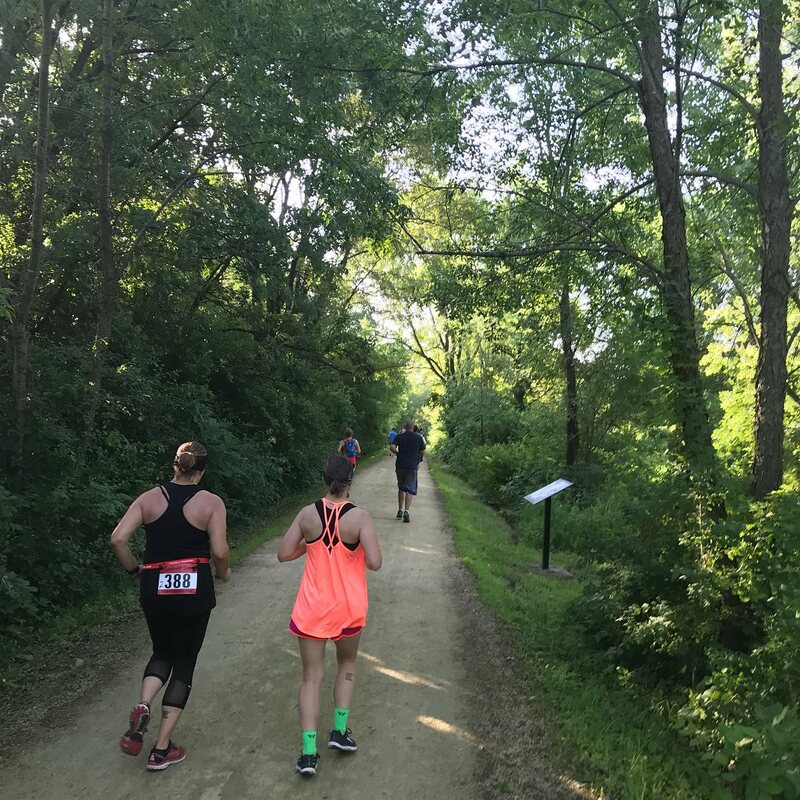 The first 0.8 mile of the race was actually an out-and-back along the asphalted Beltline Road and not on the trail. I guess we were only running 25.4 miles on the actual Heritage Trail, hence this part of the race. At the turnaround point, located alongside a lumber manufacturer property was a bagpiper. 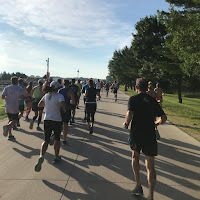 We made our way back to the starting area near the picnic pavilion with lots of cheers from spectators, before taking another u-turn onto the faintly marked grassy area running parallel to the asphalt road we just ran on. Eventually, we would come off of the grass and get back onto the asphalt, but that was just a short section, because we would then get onto the crushed limestone and gravel terrain of the actual Heritage Trail - essentially a dirt road - which we would be running on, save for a few road crossings for the remainder of the race. 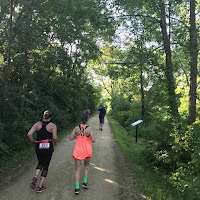 The course was pretty quiet, and without many landmarks or elements to take note of, unlike many of my other race reports, I'll only be able to write so much from the notes I jotted down and could remember immediately after the race. We ran by several plots of farmland, so the early miles, such as near the mile 3 mark smelled like cow manure. Over the next few miles, we would be running fully exposed to the bright and shining sun, with no shade whatsoever. While open farmland for miles was to our left, only a few hundred feet to our right, we could see the highway - US Route 20, a major four-lane divided highway that cuts clear across the state. The heat and humidity was starting to become a factor for me already, so I eased back on my speed and kept my pace nice and easy with sub-11 minute miles. 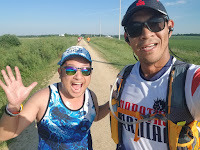 My friend Jun from Minnesota would end up catching up to me around this area, and through already building up sweat, we would run together for a short period of time. Little did I know we were trending uphill over these next few miles, eventually reaching the highest point of the race at 1,089 feet above sea level, some 134 feet above the elevation we had started at, just before the 6 mile mark. Fully exposed only 4 miles into the race. It's so hot! From mile 6 on, the course would trend downhill to flat, with a few rollers, but first, we would run through a section of the trail north of the small 1,500 person city of Farley. The first relay exchange point was at the 6.6 mile mark, just before we run through a short culvert under Holy Cross Road. Of course, I end up getting through my first issue of the race (other than the heat and humidity) as I accidentally inhale a flying bug. I'd have to stop and walk, because it feels like the bug went down my windpipe and was getting caught in my throat. At one point I stop, and with my hands on my knees, feel like I’m going to throw up; thankfully, I’m able to spit out whatever nastiness from the bug, but it’s still feeling pretty gross. It shows, as my mile 7 split is the slowest so far of the race - an 11:34 mile. A volunteer near a road crossing is able to offer me a swig of water to try to clear my throat. It works, as I’m finally able to run again. 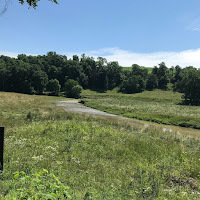 The course meanders by a nearby stream known as Hogan's Branch, and somewhere near mile 10, I hear really loud cow mooing its face off, but nowhere to be seen. Perhaps it sees us, or senses our presence as we run by. 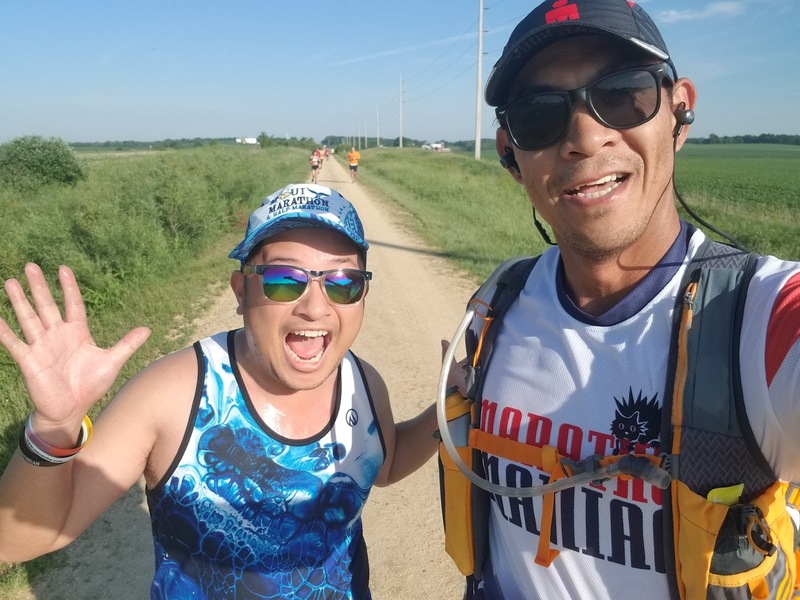 At mile 11, we cross Gun Club Road, and I run my fastest mile since the first mile of the race, just as we pass just north of another similarly small city - Epworth, Iowa. 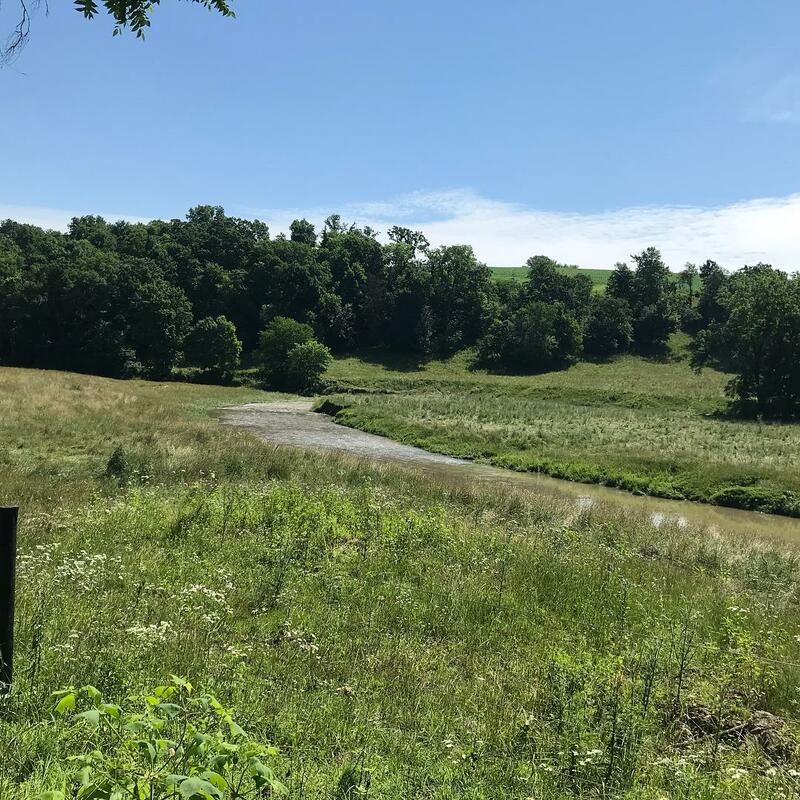 At the 12 mile mark, the trail starts to run roughly parallel, but sometimes crossing, over the Little Maquoketa River, which Hogan's Branch had flowed into. The river, a direct tributary of the upper Mississippi River, is considered one of the best smallmouth bass and trout fisheries in Iowa, and is never located too far from the trail during the remainder of the race. In fact, the river offers some of the prettiest views throughout the race. Soon, we come to the halfway point of the race, and I pass it by in about 2:20:57. Not terribly fast, considering the flatness of the road, but just about right when I take the heat and humidity into account. 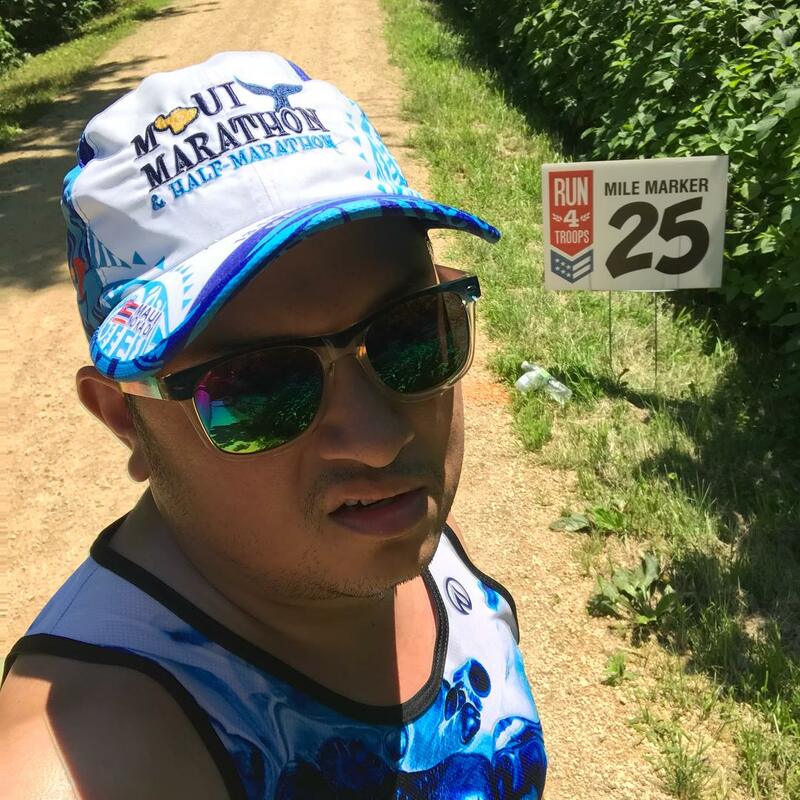 My body is tired and hot, so my mile pace begins to slow, and save for a 10:53 mile at the 13 mile mark, it never returns to a sub-11 minute mile. Having enjoyed a bit of shade from the surrounding trees, when we reach the 15 mile mark near the barely discernible town of Graf, the path becomes pretty exposed again over the next couple of miles. The later the day becomes, the tougher the race is because of the heat, and I end up hovering near the 12 minute mark per mile. 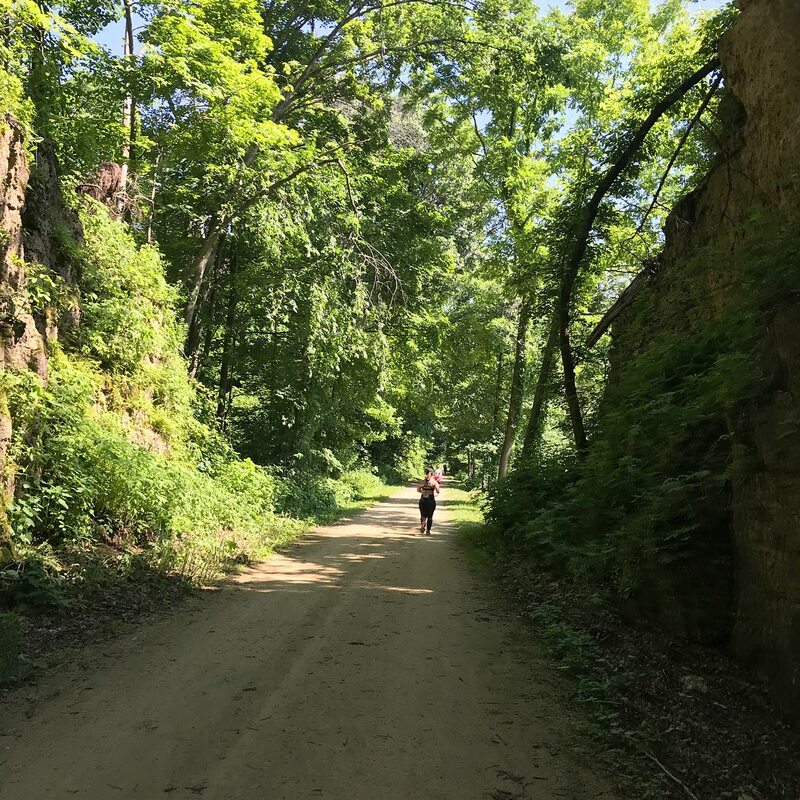 We run by sheer limestone bluffs near the 18 and 19 mile marks, just before passing the last relay exchange at Budd Road. 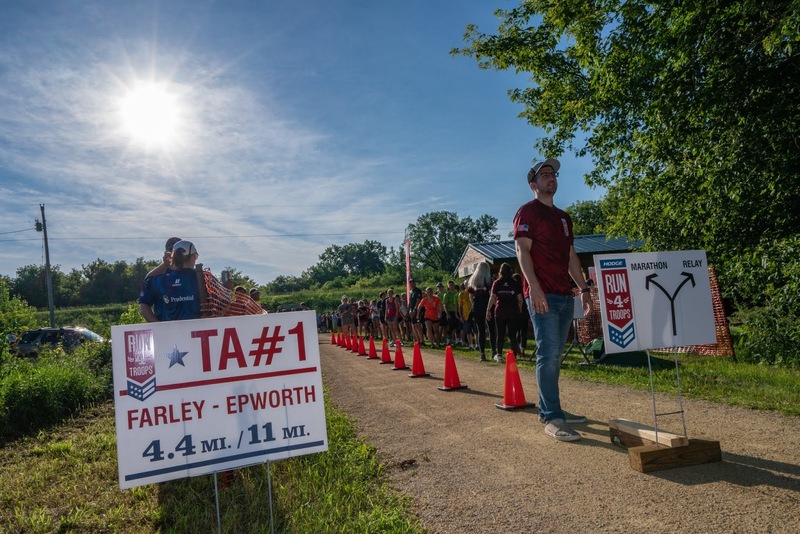 Near the 21 mile mark, an official-looking sign was planted along the trail that said "Look Right" - through the trees and in the woods high up on the side of a small limestone cliff was an American flag. 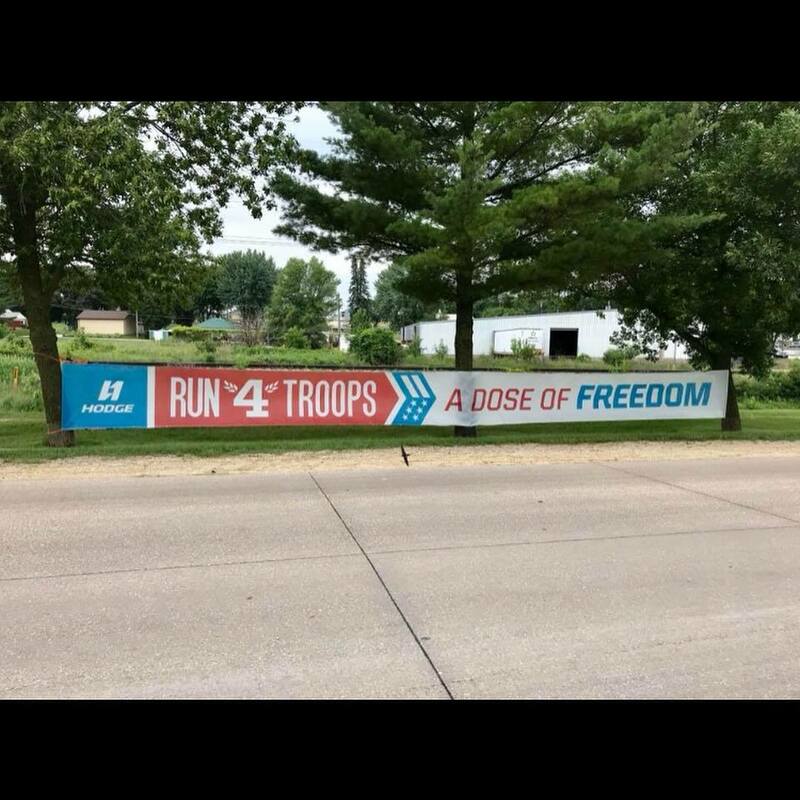 Apparently the land owner put the sign there, which was a nice gesture, considering the Run4Troops race's cause! Just before the town of Durango at mile 22, we passed by a house situated along the trail; on their land, they had organized some small vegetable gardens and an orchard - but they used wooden posts in the orchard that resembled crosses, and skeptically, I wondered, "WHY IS THERE A CEMETERY ALONG THE TRAIL?!" Apparently, I would not be the only one who thought that, as runners I'd pass nearby made the same comment. 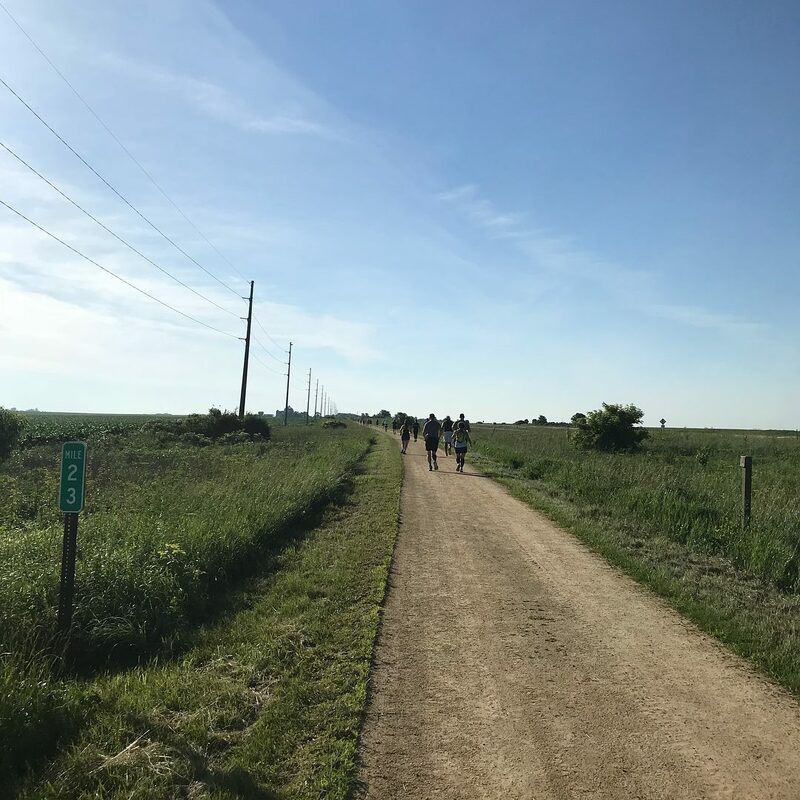 From the town of Durango, the trail runs parallel to the road (Iowa Route 3/US Route 52) for about 2.5 miles, so periodically, we would sometimes hear the cars rush by just on the other side of the shield of trees. While still just outside of the Dubuque city limits, we were inching ever so close as the miles ticked by. Just after the mile 24 mark, we ran by a span of a truss bridge on display alongside the trail. Upon later research, I found that this was one of four spans of an original 1872 bridge that was once part of a bridge that went over the Mississippi River from Dubuque, but was relocated in 1992 to its current location alongside the Heritage Trail to serve as a "rest stop" for hikers along the path. 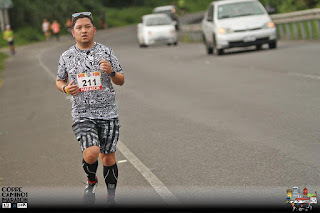 My traditional mile 25 photo! With a mile left in the race, I passed by the mile 25 mark. The last four miles were pretty slow, averaging 13:39 per mile, and with my watch showing 4:50 tick by, I knew I would be just over 5 hours for this race. Suddenly, I run into a cloud of flies, and unsurprisingly, I spot a deer just grazing near the trees right next to the trail. It gets spooked at my sudden appearance and runs away. 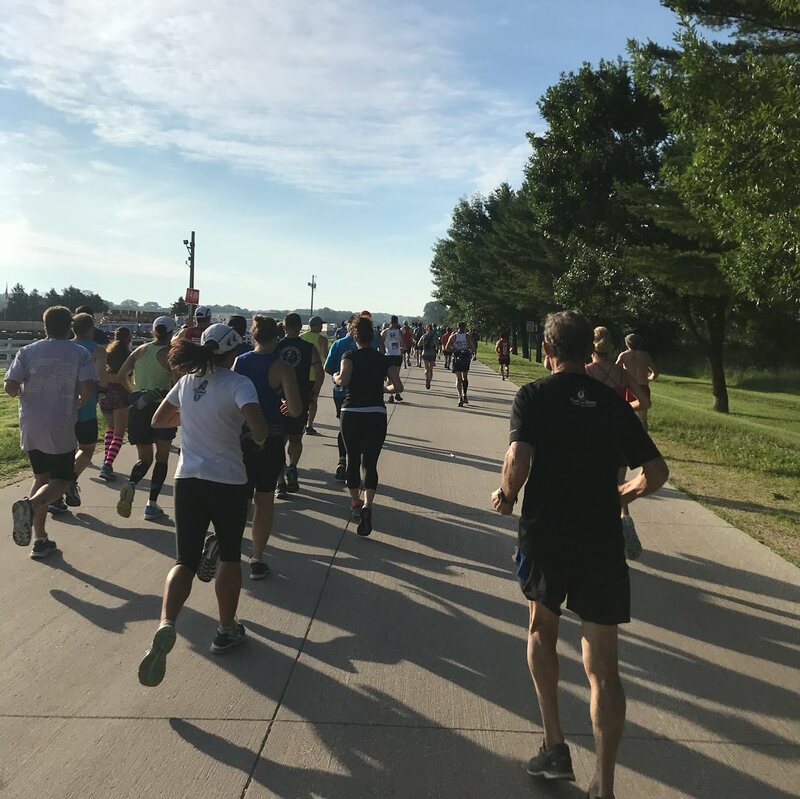 Eventually, we come out of the trail at Deere Street, and run into a parking lot next to Heritage Pond into the town of Sageville, where the finish line is in sight. While the trail, now in paved form continues another 3.3 miles into Dubuque itself, I cross the line in 5:07:48. Finally, I'm done, overheated, and ready for a cold towel, which is immediately handed to me as I seek shade. 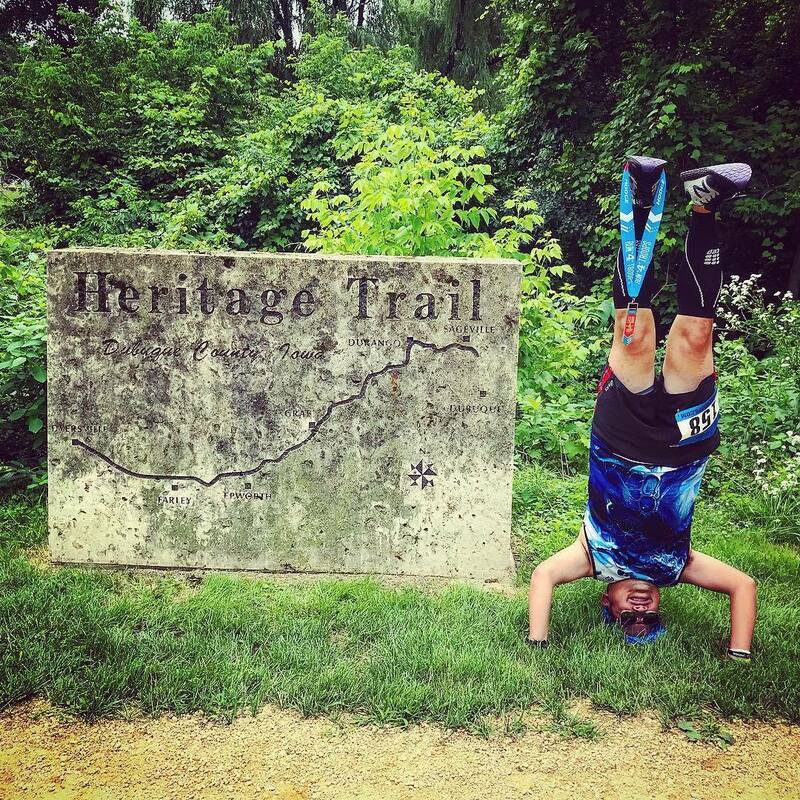 Victory Headstand along the trail! I waited for Jun to finish, only some 13 minutes behind me, and have him take my headstand photo for me near the limestone Heritage Trail sign we passed in the last few hundred meters of the race. I got a shuttle to back to the Hilton Garden Inn to my car, and then drove the 1.5 hours back to Madison for a well deserved shower. I proceeded to have an eventful rest of the weekend with my family friend Elin. Saturday was fairly low-key, just exhausted from the morning - so with Elin and her family, we just stayed at home and watched some TV. The following day, I switched a 6:30am flight that I was scheduled to be on to later on in the day, so I could be a tourist -- we parked near the University of Wisconsin, and enjoyed a beverage on this relaxing summer Sunday at the Memorial Union Terrace, then drove around Madison to check out some Frank Lloyd Wright buildings, such as his First Unitarian Meeting House, built in 1951, and is recognized as one of the most innovative examples of church architecture in the world. I got back to the Madison Airport for my evening flight, which would end up being delayed for an hour, as we sat on the tarmac waiting for air traffic control to let us finally go. Thunderstorms over LaGuardia would delay us even more, putting us in a holding pattern over western Pennsylvania for about 40 minutes before we were finally cleared to land. Because of delays, I'd end up sitting on an airplane for over five hours, half of that actually in the air. But I had Iowa done, and that was the most important part for me!